The Old Town-Orono hockey team poses on the ice after beating Greely 3-2 in overtime to win the Class B state championship at The Colisee in Lewiston in this March 10, 2018, file photo. The Old Town-Orono Black Bears have lost their most experienced defenseman and one of their team leaders for an indefinite period due to a broken collarbone. 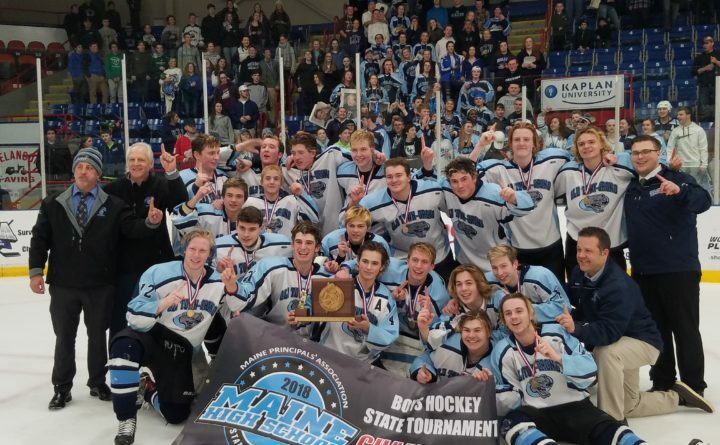 But even without senior Cam Tower manning the blue line, the defending Class B hockey state champion Black Bears take a 5-0 record into an intriguing matchup against Class A North unbeaten Bangor at 6:30 p.m. Wednesday at Sawyer Arena. Thurlow hopes Tower will be able to return by the end of the regular season or the playoffs. He suffered the injury in a 12-0 win over Messalonskee of Oakland on Dec. 27. Since then, the Black Bears edged Hampden Academy 2-1 and thumped Messalonskee again 10-0. Tower had six goals and 14 assists a year ago and was part of a defense trio labeled a “three-headed monster” by Thurlow. The other two defensemen, Josh Wheeler (6 & 17) and Finnish exchange student Antti Jarvikare (9 & 17), have moved on. So has reliable defenseman Austin Soucy. That has left Thurlow with a young defense corps, but he has been pleased with its progress. The defense-minded Black Bears have allowed only seven goals this season. Juniors Dylan Street and Nate Young have stepped up to be the leaders on the blue line. Young, who had two assists in the 3-2 state championship game overtime win over Greely of Cumberland Center, was moved back to defense before the Tower injury. “We wanted a nice, puck-carrying defenseman so we moved Nate back,” Thurlow said. Freshman Chase Campbell, the third defenseman, has played well, he said. Sophomore Dominique St. Louis and freshmen Connor McCannell, Tyler Kenney and Peyton Vose are developing and vying for the fourth and fifth spots on defense. Old Town-Orono also features an experienced and group of speedy forwards who have done an exceptional job backchecking in addition to producing goals. “We focus a lot on team defense,” said junior Sam Henderson, the left wing on a line with junior center Tyler McCannell and senior right wing Trent Lick. McCannell led the team in goals a year ago with 27, including two in the state final. He also had 14 assists. Henderson had 15 & 17 and Lick had 10 & 15. Sophomore co-captain Tanner Evans (16 & 13) centers the other line between juniors Jackson Campbell (1 & 4) and Gabe Talon (1 & 1). “Jackson has really stepped up this year, and Gabe has improved tremendously,” Thurlow said. Sophomore Zach Needham (3 assists last season) and freshman Maddox Sapiel also see some action up front. Thurlow, a longtime assistant at Orono High before staying on when Old Town and Orono merged into a cooperative team for the 2013-14 season, replaced the retired Denis Collins after last season. Collins had been the only coach for the Black Bears. “The transition has been good. Luckily, I know the kids pretty well, and I have great assistant coaches who make my job easy,” said Thurlow, referring to Cory Thibodeau, Lucas Shorette, Austin Sheehan and David Wilcox. Old Town-Orono isn’t a big, physical team but Thurlow said the Black Bears make up for it with their team speed. “Our guys get to the puck first and win battles in the corner,” said Parker, who was 18-1 with a 1.72 goals-against average and .909 save percentage last winter. Thurlow and the players said there is definitely a target on their backs after becoming the first co-op boys team to win a state title.